FILE - Yemeni people inspect the damage after an airstrike by Saudi-led coalition in Sana'a, Yemen, Saturday, Feb. 27, 2016. Saudi Arabia says it is ending its "major combat operations" in Yemen, one year after launching Arab coalition airstrikes against Iranian-backed Houthi rebels. A Saudi military spokesman, Brigadier General Ahmed al-Asiri, told the Associated Press Thursday that the coalition will continue providing air support to Yemeni forces and help build an army. The White House said it welcomes the Saudi statement and added there is a dire need for a political solution in Yemen. Iranian-backed Houthi rebels seized the capital of Sana'a in 2014. They sent the internationally recognized government of President Abdu Rabu Mansour Hadi fleeing to exile in Saudi Arabia before returning to the southern port city of Aden. 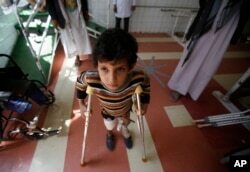 FILE - A young boy who lost his leg in the Yemen war uses a prosthetic limb at a government-run rehabilitation center in Sana'a, Yemen, Saturday, March 5, 2016. The fighting in Yemen, along with the Saudi-led airstrikes, have obliterated entire neighborhoods and killed more than 6,000 people - mostly civilians. They include 119 killed by an aitrstike on a market northwest of Sana'a Tuesday. The U.N. says 80 percent of Yemeni civilians are in dire need of food and medical help. The Saudi-led coalition entered the fight last year. Some Mideast experts say the coalition action did nothing to help push all sides toward a peace settlement. The U.N and human rights groups accuse the coalition of deliberately firing at civilian targets - a charge the Saudis deny.